Maldives is an islands country located in the Indian Ocean, southwest of India. Constituted by 1,196 islands, of which 203 are inhabited. They are grouped in 26 atolls each bearing the name of one or two letters of Thaana writing. Its capital and most populated city is Male. The country has a tropical and humid climate, influenced by the monsoons. Islam is the predominant religion, and was introduced in 1153. It is the least populated country in Asia and the least populated among the Muslim countries, and one of the smallest Asian countries in size. It is also the country with the lowest maximum height in the world, only 2.3m. The Maldives economy has historically depended on fishing, until about four decades ago when tourism has gained weight to become the main economic engine of the country. The success of tourism, managed under a low intervention model to sustain local culture and enconomy, is due to the chromatic richness of its waters and the abundance of its underwater life, which has made it one of the best destinations in the world for sea lovers. The language of the Maldives is the Dhivehi and its currency the Rufiyaa or Rupee of Maldives (Rf). Residents of the European Union need a passport valid for more than six months after the stay in the country and a departure ticket from the country prior to 30 days, since at the time of arrival Visitors will automatically receive a tourist visa that will allow them to stay in Maldives for 29 nights / 30 days. It is the responsibility of the traveller to ensure they have the proper documentation to enter each of the countries on their itinerary and to return to their country of origin. The Reservations Office and its staff cannot assume any responsibility for passengers who do not have the proper documentation. When arriving on board you will have to pay local tourism taxes; you can ask the exact amout to your travel agency or Submaldives. Airport departure tax: There is currently no airport departure tax to be paid in Maldives. On our vessels you can pay in euros or its equivalent in american dollars. In the gift shops and tourist bars you can also pay in euros or dollars so you do not need to buy local currency upon arrival. We recommend bringing cash for payment of government fees, crew tips, bar drinks on board, gifts and other possible expenses that you want to make in the country. In Male it is easy to pay by credit card, but in the rest of the country is not so common. IMPORTANT: Maldives have stopped accepting the old dollars, the only valid currency are the post-2009 notes. On the ships we have 2-pin European adapters and multiple plug adapters to be used in a large battery charging area. If you need to connect many plugs, we recommend you bring your own multiple plug adapters. Telephone: the telephone system and the mobile network coverage in Maldives are limited. The country code is +960 or 00960. 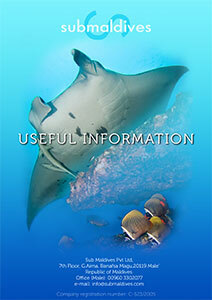 Data coverage, although limited, exists in almost all diving areas, with variable quality. The best way to stay connected in Maldives is to use a local SIM card. In the WIFI section below you will find the details. Do not forget to bring your dive certification. The divemaster needs to check all your diving documentation before the first dive. The necessary documentation is the diving certificate, the Nitrox certificate if applicable and a valid dive insurance. If you do not have a Nitrox certification and you are going to be on one of safari boats with enriched air you can ask your agency for the possibility of taking the course with us during the trip. We strongly recommend all passengers to consider a travel insurance including health, accidents, luggage and trip cancellation when they book the trip. Travel insurance will avoid financial hassle if you are unable to make the trip due to health reasons, illness of a relative or unforeseen circumstances that prevent the airline or maritime company from taking you to Maldives and carrying out the planned trip. The ships have a first aid kit on board which includes oxygen. You may bring medication for motion sickness if you feel it is necessary. We recommend that you check with your doctor about the options available, such as scopolamine transdermal patches, Biodramine, Scopace pills or Stugeron. Currents and winds can cause occasional moderate boat movements. We recommend a pre-trip medical check. The boat crew are not allowed to store medication for the passengers, even if it requires refrigeration. If a passenger carries medication that needs to be stored at a certain temperature, they will have to travel with a portable cooler or store it with cold gel bags. The crew can help with cold gel bags without any problem, but cannot take any responsibility for the proper care and storage of the medicines, which should be kept in the passenger cabin. We recommend that you bring sunscreen, mosquito repellent (in case you disembark on a local island, since there are no mosquitoes on board) and basic medicines of frequent use. Do not forget to take basic precautions, such as taking care of injuries caused by corals, which tend to become infected and be very annoying, and rinse your ears with fresh water after dives or after snorkeling since the abundance of microorganisms can cause irritation. There are 3 hyperbaric chambers in Maldives. If it is your anniversary, birthday, honeymoon, wedding or if you are celebrating your 100th dive, please let us know so we can celebrate it with you. We would be grateful if you notify your travel agent or Submaldives prior to your departure so that we can advise the crew in advance. The temperature of the sea at diving depths varies between 27 ° C and 30 ° C throughout the year. Many passengers make up to 3 dives daily, so they need to protect themselves; We recommend a 3mm wetsuit for all the seasons or a 5mm if you feel the cold a lot. All dives are made from an auxiliary boat called dhoni. All diving equipment will always be on the dhoni which will not always be accessible from the main boat. It is necessary to take it into account when considering what is diving equipment and what is not. Most of the dives are deeper than 12 meters. And we usualy look for places with current, where we can find the fauna that we want to see. For that reason, Open water juniors will not be able to participate in all dives. IMPORTANT: It is mandatory to bring a dive computer and safety buoy, and of course to know how to use them. The standard diving tanks are 12 l and aluminum. We have 15 l steel tanks available. If you want to rent one, it is necessary that you communicate it in advance to your travel agency to have it prepared the day you arrive. The cost per week is 60 dollars. The tanks may use the international or DIN standards. On board we have rental equipment, but being a boat, we do not have the same amount as a dive centre. Therefore it is also necessary that you communicate it in advance to your travel agency so that we have it planned before your arrival. IMPORTANT: We insist on the obligation to have a dive computer and safety buoy per person. Be also sure you know how to use them. We recommend comfortable summer clothes covering shoulders and cleavage in the case of women on the day you will visit a local island and / or Male city, since Maldives is a Muslim country. On board, each passenger will have two sets of towels (for shower and for diving / beach / pool), so you do not need to bring your own towel. It is recommended to bring in the toilet bag, in addition to the personal shampoo (according to boat) after-sun cream and any other type of lotion you need, since in Maldives you will only have occasion to buy personal hygiene items in the Airport pharmacy when you land. Check with your travel agent the the specific conditions for southern Maldives routes or longer especial routes. Passengers arriving to Maldives on Saturday will be met at the exit of the international airport by a uniformed member of our crew who will carry a sign with the words Southern Cross / Maldives Crown / Iruvai. When arriving at the airport it is the right time to buy the internet SIM card for your mobile phone. See the WIFI section below. When all the passengers have arrived, they will be taken to the live aboard ship on the dhoni (typical Maldivian boat). Approximate check-in time at the dhoni is 11:00 am. Upon arrival on board and after a welcome drink you will be briefed about the boat how everything will work during the trip and about the safety on the vessel. You will also fill the tourist form and will pay the government fees and the rental equipment. The trip leader will check the diving certifications and insurance. Approximately at 13:00 the rooms will be assigned and food will be served. If weather and navigation allows it, the first dive will take place the same day. If weather conditions so permit, we will take 2 or 3 dives per day. A total of 18 dives. After diving on Friday (on the week-long cruises from Saturday to Saturday, otherwise the last day of diving), the boats will return to Male approximately at 13:00. Passengers can spend the afternoon in Male to go shopping, visit the fish market, the local market (vegetables and fruit) or take a tour of the city. During the tour, there is a free guide service. Dinner will be served on board. During that afternoon, the crew will clean the diving equipment of the passengers who wish so, and will hang them around the boat to let them dry. It is advisable to pick up the equipment the next day in the morning so that they have dried as much as possible. There is no WIFI available on board. However, if you need to be connected during the trip, you can buy a local SIM card for unlocked cellulars, iPad or tablets. If your phone is locked we have a modem on-board where you can insert the local Sim card. There are several pre-paid options and data packages for SIM cards, depending on your needs. The approximate price goes from $10 to $40. Please, consider you may be able to share the connection between two or more people depending on the devices used. In Maldives there are two mobile operators, Ooredoo and Dhiraghu, and both have an office at the airport so that they can make the arrangement on the fly. Beware, only for unlocked phones! It is important that you ask the mobile operator staff at the office to activate the card because depending on the brand of the phone this is done in a different wat. Be sure to get out of the store with the data connection running! Available in Iruvai, Southern Cross and Maldives Crown. Check with your agency or with Submaldives. Crew tips are not included. We believe that tips should be voluntary and based on the quality of the service received. When you check out on Friday, the guide will have an envelope for tips, which will be distributed equally among the crew members. Southern Cross: 75 – 100 $ per person and week (120 – 170 $ in 10 days cruises). Maldives Crown: 150 – 175 $ per person and week (180-220 $ in 10 days cruises). Iruvai: 100 – 150 $ per person and week (150 – 200 $ in 10 days cruises). On Saturday morning, after a continental breakfast, passengers will be taken to the Ibrahim Naseer International Airport at approximately 8:30 am to arrive at 9:00 am (check specific conditions for Southern Maldives routes). Regulator or bcd 12 $ per day and piece. Mask, suit and fins 6 $ per day and piece.